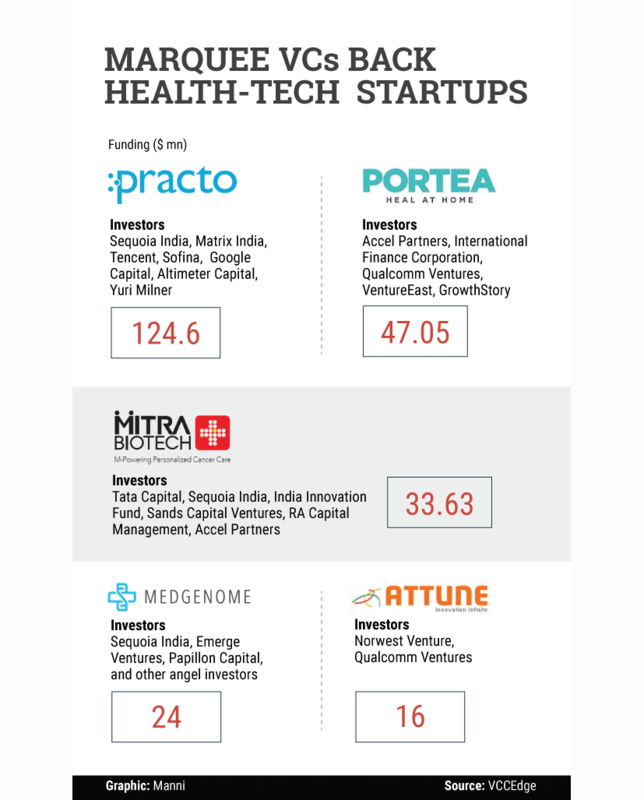 Healthcare has always been a sought after sector when it comes to investments. Growing population, awareness and better incomes will only improve the state of healthcare in the country and the opportunity is clearly not lost on investors who have always believed in India's consumption theme. To be sure, the healthcare sector saw investments worth $1,458 million in 2015 across 144 deals, compared with transactions worth $1,342 million across 124 deals in 2014. Practo: Founded by Shashank ND and Abhinav Lal in 2008, the most funded healthcare startup in the country, Practo, is a platform for doctors and patients. It has a search tool which facilitates patients to find doctors. Apart from medical services, they also have spa and salons and fitness search tools. Patients can look for clinics, doctors, answers to their health queries, etc. For doctors, there is a separate medical software called Practo Ray, which helps in managing the practice better. Portea: Founded by Zachary Jones and Karan Aneja in 2012, the company was bought by Meena Ganesh and K Ganesh Krishnan in 2013. Portea's aim is to bring world class medical care to a patient's house and make it more accessible and affordable. Apart from its presence in 24 cities in India, it also has presence in Malaysia. It sends nurses, doctors and physiotherapists for home visits. It also facilitates lab tests at a patient's home and provides medical equipment on rent. Mitra Biotech: Founded by Dr. Pradip Majumder, Mallik Sundaram and Shiladitya Sengupta in 2009, Mitro Biotech is working on cancer cure. The company is trying to bridge the gap between drugs and the cancer patient by suggesting drugs personalised for a patient. Hospitals, doctors and cancer patients can send biopsy reports and samples to their lab and they will suggest the most optimal drug prescription for that specific patient in a short duration of as much as seven days. MedGenome: Founded by Sam Santhosh in 2011, MedGenome is genomics-based diagnostics and research company. It offers clinical, genetic counselling and genomics solutions. It uses DNA sequencing to conduct clinical genetic testing of complex diseases related to oncology, cardiology and ophthalmology among others. These tests help doctors determine how different medicines will react to different patients. Attune Technologies: Founded by Anand Gnanaraj, Ramakrishnan V, Arvind Kumar and Mohanaraj Paramagurusamy in 2009, Attune is a cloud-based healthcare technology solutions provider, headquartered in Singapore. In order to increase operational efficiency and revenues, their solutions are used to integrate labs, hospitals, pharmacies, blood banks, radiology, medical devices and accounting. Other than India and Singapore, it has units in Indonesia, the Philippines, Sri Lanka, Malaysia and Kenya, among others.